The harness mount face down asit was found. 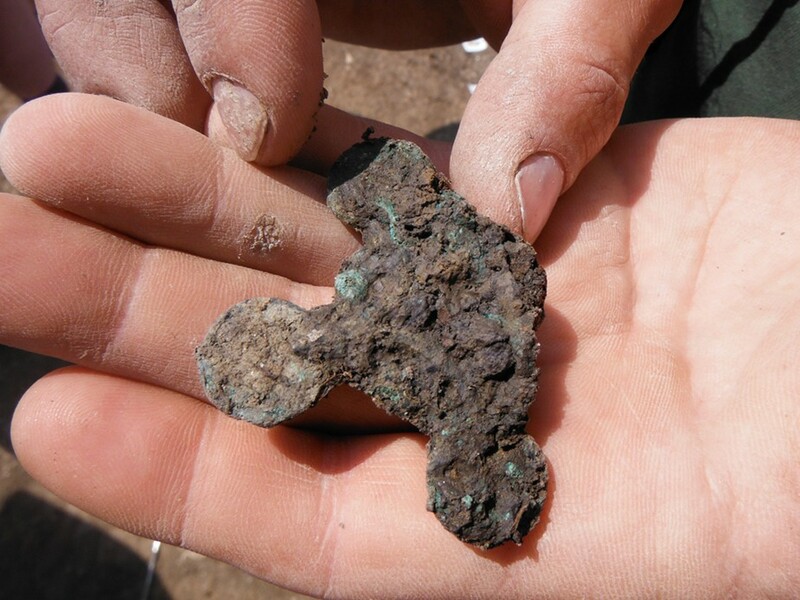 We were lucky enough to be able to send some of our artefacts off to conservation during the excavation, which means I can show you quite early on what some of the cleaned up copper alloy artefacts look like. Some of the preservation is really quite outstanding. I’ll start with the horse harness mount, which is our star find, particularly as it comes out of the wall trench of the hall building and means we can use it to help date the structure. 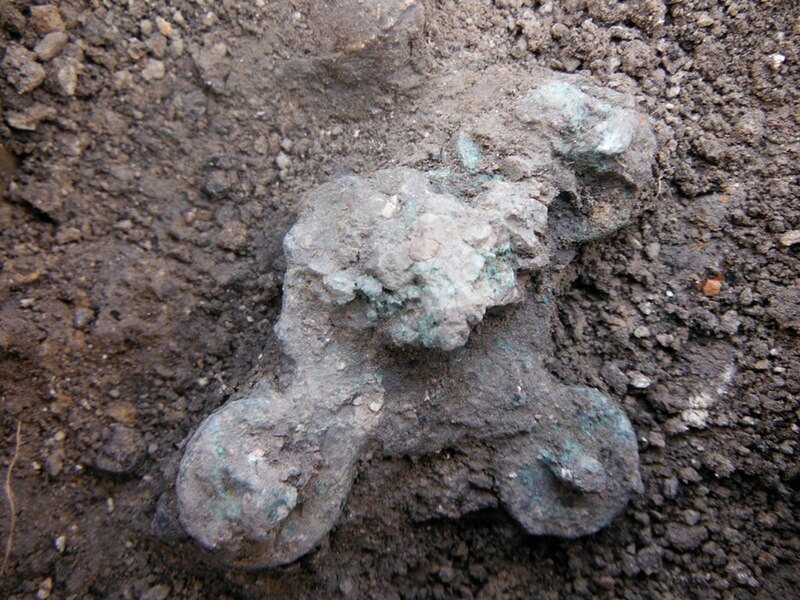 The horse harness mount as it came out of the ground. You can see the shape and some of the decorative elements, but it needed cleaning and conserving if any detail was to be found on it. We were then able to get the mount x-rayed while the dig was still going on, as we were able to enlist the services of Dana Goodburn-Brown, who runs the CSI: Sittingbourne centre, conserving the Saxon finds from Sittingbourne Cemetery and enlisting the help of volunteers to learn conservation techniques. 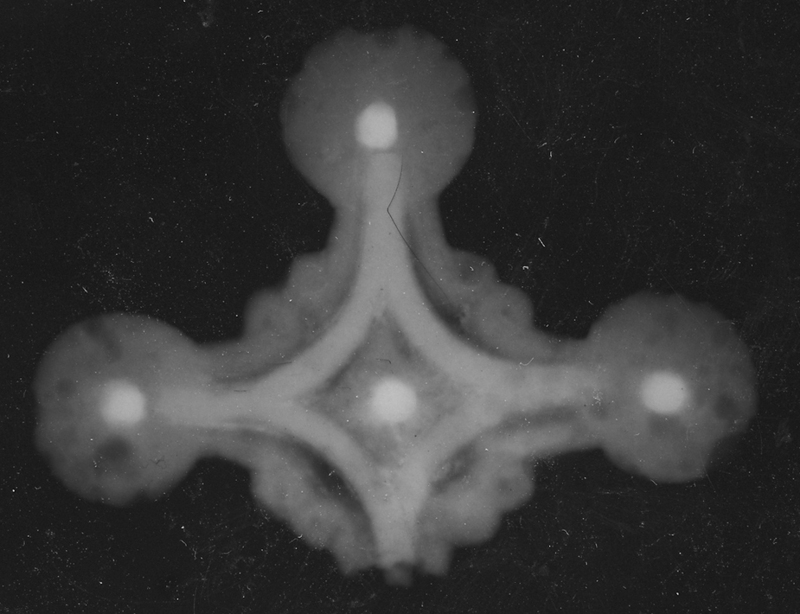 The x-ray of the harness mount. This was the first time we got a glimpse of the possibility of decoration. More than we could have hoped! Finally, conservation was completed and we are able to show you the whole mount below. The piece is gilded and the central decoration is an abstract animal, typical of what is known as Style I animal art. 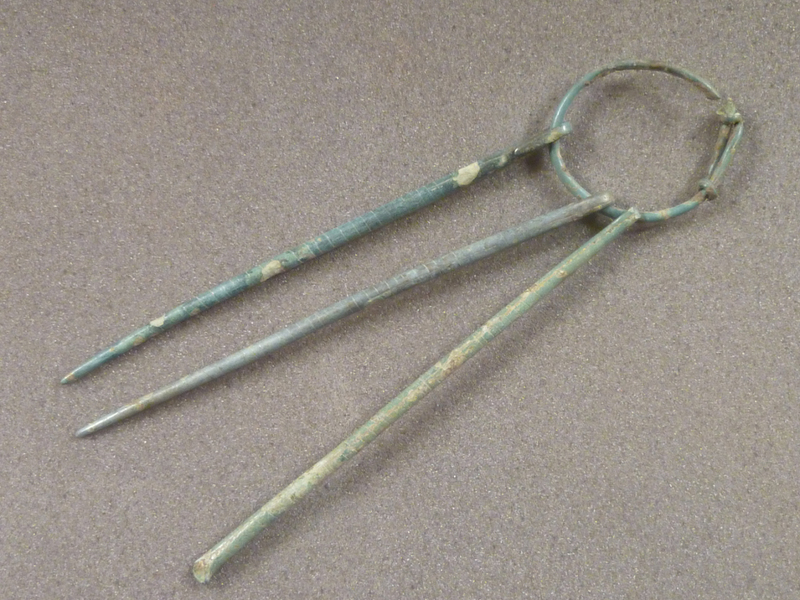 It dates to around 525-575 AD, and would have had a fourth terminal, broken in antiquity. Probable harness mount recorded in the Portable Antiquities Scheme. 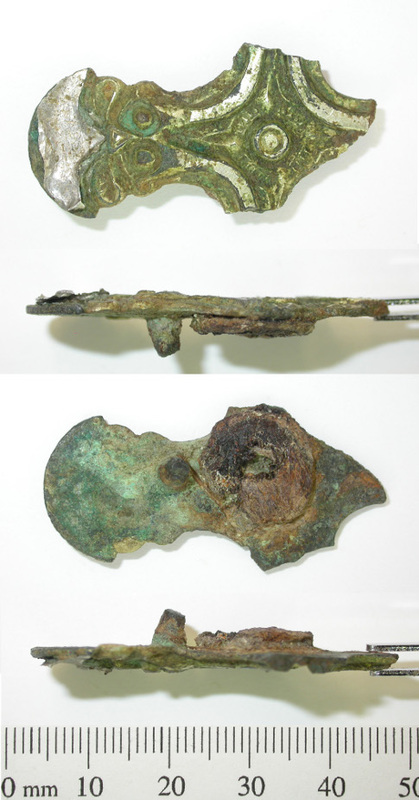 Image courtesy of the Portable Antiquities Scheme. 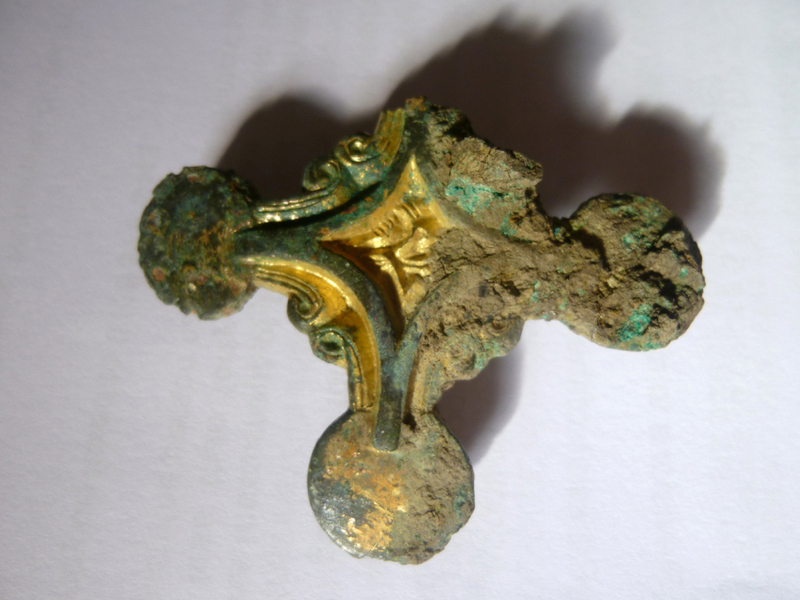 We’re really very excited about such a beautiful and evocative find, which shows that high status artefacts were being used on site. This supports the view of pre-Christian culture in this period being based on a warrior society, with horses at forefront of this ideal. 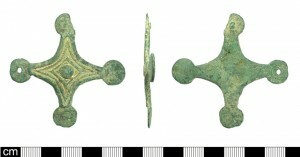 This mount (right) found in Derbyshire, recorded with the Portable Antiquites Scheme, is of a similar form and date, although its decorative scheme is slightly different. 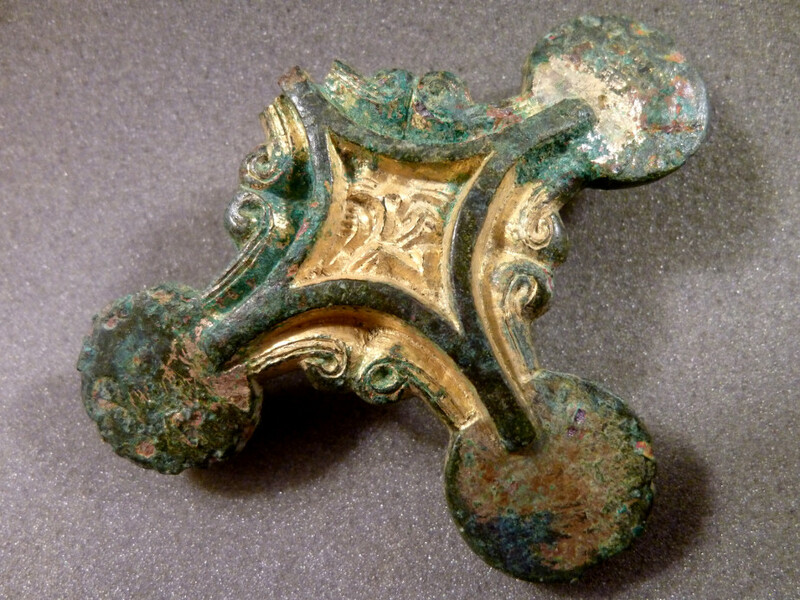 Another similar gilded mount is the one below found in Cambridgeshire, almost complete, but with a geometric design. You can click on the smaller images here to enlarge the photos, as you can with any of the images on this blog. 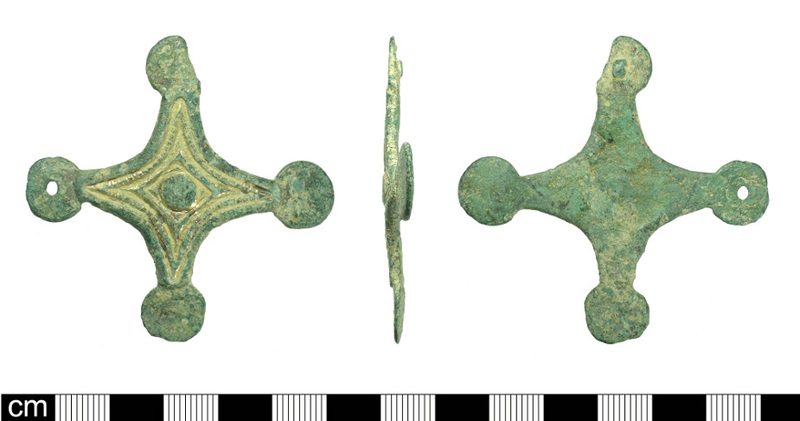 A similarly shaped harness mount from south Cambridgeshire, without the animal decoration. Image courtesy of the Portable Antiquities Scheme. The Toilet set was remarkably well preserved to begin with, but this post-conservation photograph really shows how almost new it was – the tools still rotate on the wire ring! We’re also waiting for the non-metallic finds like the bone combs to come out of conservation, so I’ll write about that when we get them back. Objects that are made of bone, shale or other organic material require very different treatment. I’ll keep the blog updated as we get more things back from conservation. It’s great to see some of the artefacts that we were sure would once have been splendidly decorated reveal what we hoped for. The harness mount is staggering, what a find! Excellent photographs! But let me ask a question: What exactly is a horse harness mount? I have a vague idea what a horse harness is but I have absolutely no experience in riding horses so I don’t know how such a thing like this mount might have worked or for what purpose it was used. The mount would have been attached to a horse’s bridle, the part of harness that goes around the horse’s head, and to which you attach the reins. There would have been two mounts, one on each side of the bridle. The bridle would probably have been made of leather and the mount would have secured the leather pieces that went across the nose, up towards the ears, and the bit (the piece that goes in the horse’s mouth). We use the word ‘mount’ to describe something that was made to be attached to something else, usually organic material such as textiles, leather, or wood.